Though I had the alarm set for 6:50, I actually woke up just after 6, so I got up and started getting ready to leave. I checked the radar and the rain was coming in earlier than we thought, so Hubby got up early, too, and we packed up and were on the road by 7:45, stopping to dump at the exit to the campground, and relieved no one was there ahead of us. I was worried that with literally hundreds of RVs in the campground there would be a line at the dump, but we were first, thank goodness! We headed out, once again stopping at the Wendys at the Pilot in Dickson to pick up breakfast, but just as I was pulling out of the truck stop into the driveway of a motel next door, which was the easiest way back on the road, my truck suddenly quit. It behaved like it was out of fuel (I had ¾ of a tank), and I couldn’t get it started again. The only thing we could think of was that it was the fuel filter, so Hubby ran up the road to O’Reilly’s, who happened to be open already (yeah) and had the part we needed, and was back pretty quick. We struggled through the process of replacing the filter, keeping our fingers crossed that that was the one and only problem, and sure enough, after some good cranking for about 30 seconds, the truck started up. We were back on the road again by 10:30, having lost nearly 2 hours, and the rain lurking nearer, in fact there were showers all around us. We made one more stop at a Tractor Supply off I-840, running into occasional showers along the way. I stopped under an underpass in order to keep my hay from getting soaked once, and started to do that again under another one, but for some reason it was actually more narrow under the underpass than on the road, and it was way too dangerous to stay there, so I pulled back out when I could. Unfortunately, when Hubby pulled out to follow me, he just clipped the wheel well of the horse trailer on the guardrail, and just bent the aluminum enough to turn it into the tire, which was just enough to brush against the tire, taking a chunk out of the sidewall and making it go flat. We had only traveled a short way from the underpass when we stopped to check on it, and sure enough, flat as a pancake. I threw the tarp over the hay to keep it from getting any wetter (it was still raining, but starting to taper off), and proceeded to get the trailer up on the Jiffy Jack, get out the brand new spare we had just bought last month and get the tire changed. We were back on the road again in about 15 or 20 minutes, having changed the tire and pulled out the wheel well so it wouldn’t scrape the new tire. From there, we were only about 45 minutes from home, the rain had stopped along our route (though more was coming in soon) and we finally made it home around 1:30, many hours past our scheduled arrival, but home, safe and sound, nevertheless. 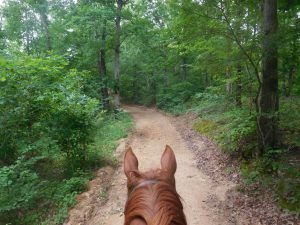 We covered the hay, put the horses out in the pasture, brought in the essentials we needed from the RV, took a shower and crashed for the rest of the day, exhausted from all the calamities we had encountered. As I had mentioned in my clinic on Friday, you need a Plan A, a Plan B, and sometimes even a Plan C, and even then, there are times when you just have to wing it. Still not sure why the fuel filter went bad, it had been changed in July last year, and we had only put 9000 miles on it, supposed to be good for 15K. So now we need a new wheel (the rim has been irreparably bent) before we can go on another trip, and Hubby thinks something else is wrong, as the wheel doesn’t seem to be running straight. Something else for him to look forward to doing after he gets his heart back in rhythm! Crashed the rest of the day and evening, to bed early! As Callie was leaving today, and Hubby still didn’t feel up to it, I arranged to take her for another ride this morning, though I wanted to go early enough to get back for two other demonstrations that were planned, one on packing for back country trips, and another on the wild mustang program, so I was up early, and had the horses saddled and ready to go by around 8:30. 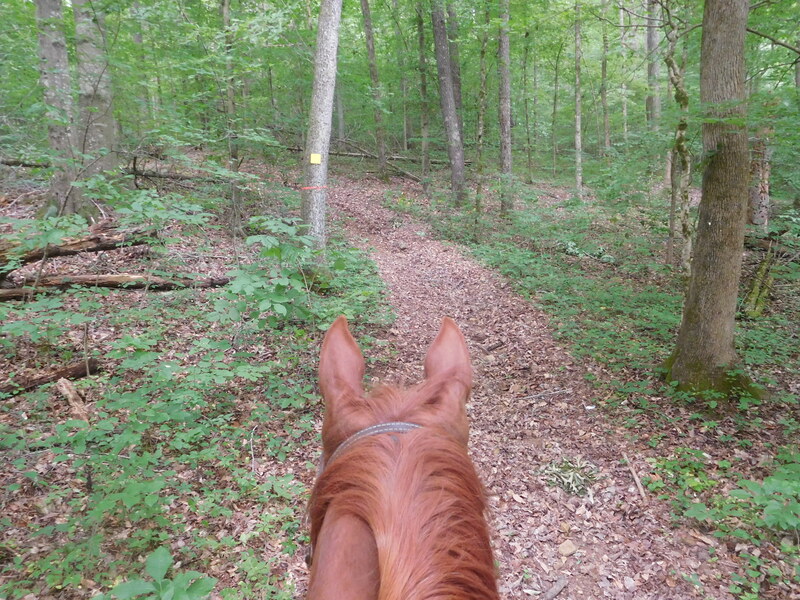 Today we headed out on the yellow trail, which took us out along the southern side of the resort. I have to say, I was rather disappointed. It seemed that they once had really nice trails here, but for some unknown reason, they had decided to maintain their trails with a bulldozer, and as far as I’m concerned, that’s the fastest and surest way to ruin a trail. So instead of winding our way through pleasant woods, we were following bulldozer tracks that had all but destroyed the trail. 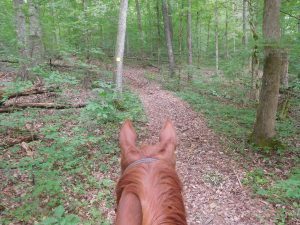 There were a lot of other, nicer trails weaving through the woods, but they were all unmarked and not on the map, so we didn’t dare take them. 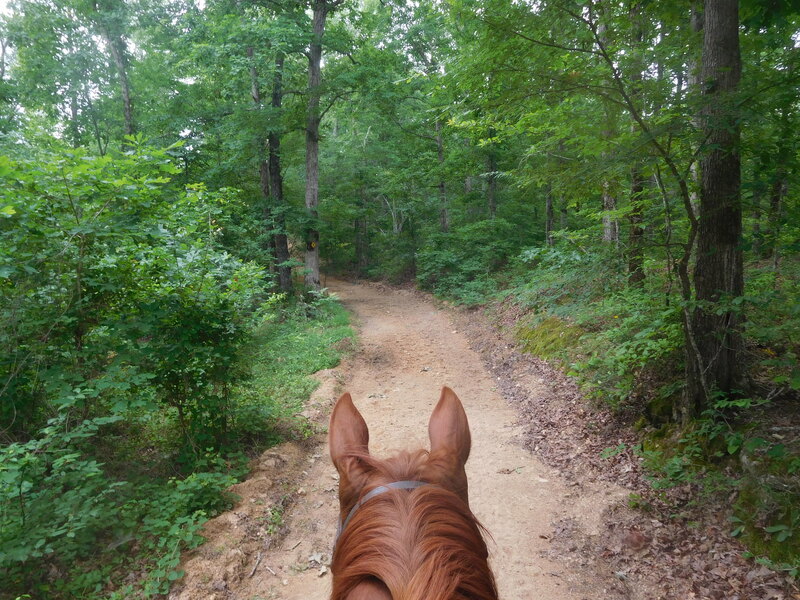 We still enjoyed ourselves, but the trails were rocky, wide and ugly, so it was only being on a horse that made it worthwhile. Callie enjoyed herself, though, and that was more the point than anything. She did much better today, even cantering up hills a couple of times, so she was obviously getting the hang of it. We did managed to get back by 10:30, and I made it over to the packing demonstration by 11:00. Turned out to be a very casual, almost unofficial packing demonstration, no mule or horse involved, instead using a barrel with a saddle on it. If it hadn’t been for a young lady named Mickie who was determined to master the art of packing, it would have been a really lame demonstration. It was mostly just answering her questions that made it interesting. I mean, how are you supposed to ask questions about something you don’t know anything about? I didn’t even know where to begin! Once that was finished, I went over to watch the mustang clinic, and even though the set up was a bit more professional, I didn’t find the demonstration particularly interesting. Didn’t really learn much about the program, didn’t really learn much about the clinician’s training philosophy, didn’t really learn much of anything except the names of the horses he had brought with him and where they were from. Sorry to say, it just wasn’t very interesting or informative, not quite sure what the point of it was. Sigh. I really wanted to learn more about it, but again, how is one supposed to know what questions to ask when one has no foundation to know what to ask? Guess I’m just a bit picky when it comes to watching presentations, as would be expected from someone who teaches people how to make presentations… Anyway, got back to camp around 2:30 and felt so tired I took a nap, then relaxed the rest of the day and evening, putting away as much stuff as I could. We’ve decided that since there is rain coming in tomorrow, that we’re going to leave very early in the morning and try to get home before the rain builds up too much. Well, today was the day! 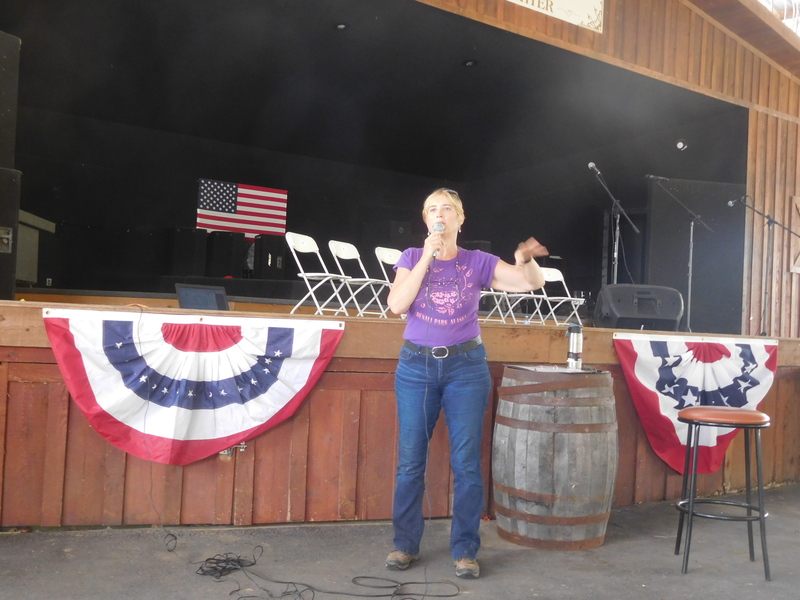 I had worked diligently on putting together what I thought would be an informative clinic on Horse Camping Across America, Top Ten Things You Should Know When You Hit The Road, and at about 2:15 I went over to the pavilion and started to get set up. There didn’t seem to be a lot of publicity or communication going on, so I wasn’t sure what kind of crowd would turn up, and it did turn out to be small yet enthusiastic. I thought it went very well, managed to sell a few books, and chatted for quite a while after I finished. I had kept Hubby in the dark completely about what I was going to do, although I did let him see my outline, and he thought it was very well done (not that he’s the least bit biased :-). It served its purpose, though, letting me get it on its feet and see how it went, and it was well received, so mission accomplished! Spent the rest of the afternoon just hanging around, nothing else really remarkable happened today, though I did walk over to the pavilion once the music started for a few minutes, but didn’t find that particularly intriguing. There was probably only about 30-40 folks in the audience, if that many. Surprising considering the crowd that’s out in the campground, the place really got packed today! Hardly any room to turn around. Not my favorite kind of “camping,” actually, my least favorite, to be honest. Got up early, stopped at Wendy’s at the Pilot in Dickson to pick up breakfast, then headed to our first of three doctor’s appointments today. Started out with a sonogram to check Hubby’s neck, he’s had a blockage in his artery, but it hasn’t changed in 10 years, and it didn’t change this time either, so we don’t have to come back again for another two years. We grabbed a quick nosh at a cute little restaurant next to the hospital, then headed over to Vanderbilt for another appointment where all went well, then finally to St. Thomas for a device check, where we learned Hubby has been in A-fib for 29 days! That coincided exactly to when he started feeling so poorly, but for some reason, his defibrillator alarm had been turned off, so we never knew! So now we’ve scheduled a procedure to shock his heart back into rhythm next week, which answers the question about whether we would go to a horse camp or home after finishing here, guess it’s home! As there was a back up on the freeway, we took some side roads, with a stop at the Walmart in Waverly for a few things, before finally getting back to camp quite late. Had just enough energy left to feed the horses, have a beer, and settle down for the evening.